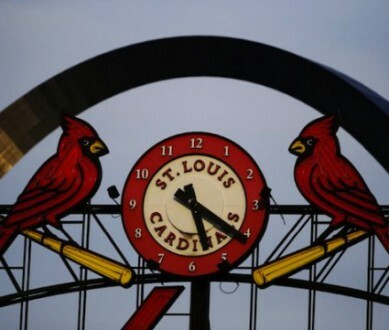 This season, the Saint Louis Cardinals decided to have their “Christmas in July” celebration on July 28th, which, of course, managed to be one of the hottest and humid days of the summer. Temperatures ranged from 100 to 110 degrees with the humidity, even at seven that night. I had to see the Reds play, though – I had not seen them live this year. More importantly, I wanted to watch one of my favorite players, someone who would probably be traded by the 31st (and, as it turned out, was). I wanted to watch Mike Leake pitch his last game in a Reds uniform. My love of baseball began in my hometown of Dayton, OH in 2000, when the Dragons became the Low-A affiliate of the Reds, and my family bought season tickets. I loved going to the ballpark as a kid and watching players who eventually got their shots in the majors – Adam Dunn and Austin Kearns really stand out in my memory. Over the years, I got to witness many a talented player pass through on their way through the Reds farm system – Dunn, Cueto, Hanigan, Votto, Bailey, Stubbs, Heisey, Bruce – many players that became the core of the Reds. I did not follow the big league club as closely, and as I moved into high school, somewhat fell out of interest with the sport, preferring to watch the (relatively) more successful Bengals. That changed when I moved away to college. I chose Saint Louis University, a mere 2.5 miles away from the cursed ground of Busch Stadium. Say what you will about Cardinals fans, but the majority of people genuinely care about their baseball team, and, because of that passion, I began to reconnect with the Reds, mainly out of a desire to experience that passion and because of nostalgic feelings for my hometown. My fandom came back strong during my sophomore year, the 2010 season when the Reds surprisingly won the central behind many of the players I remembered watching in Low-A ball. However, there was one player I did not recognize, a player who had skipped the minor leagues completely to start immediately for the Reds – Mike Leake. I loved watching him pitch, and I marveled at how underappreciated and overlooked he was as a rookie and still is by the fanbase. 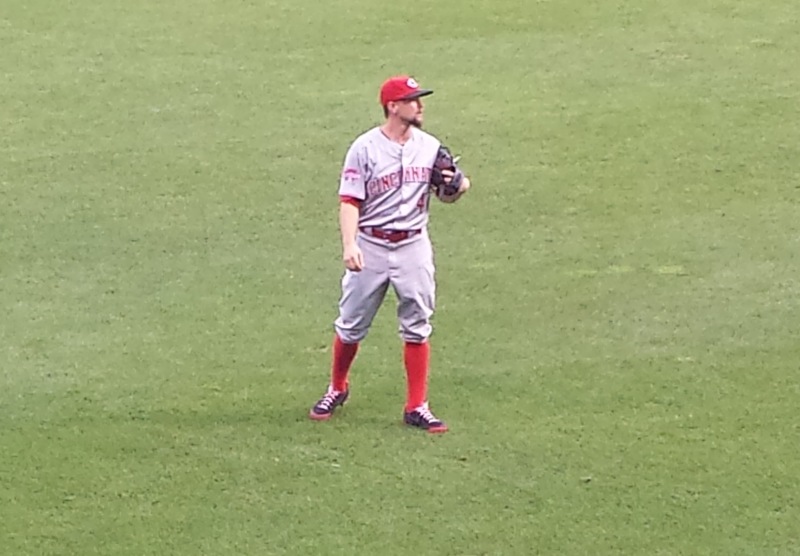 He, along with Jay Bruce, have been my favorite Reds ever since. Since I still call St. Louis home, I have seen many a Reds game (typically a loss) in Busch; in fact, I have seen the Reds play more there than in GABP, something I definitely need to rectify. Having followed the Reds closely these last five years, I knew that Leake was likely to be traded. 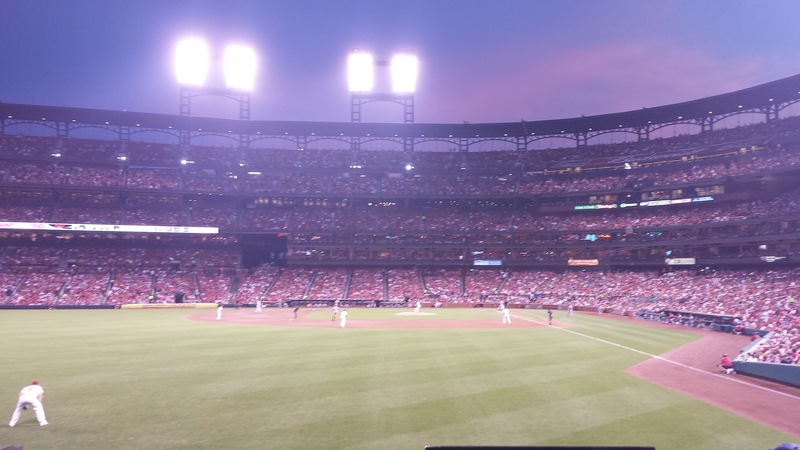 So, I made my way to Busch, sitting in the section near the bleachers in left field – for my money, the best seats in the house. You can easily see everything on the field, and you have a clear view of the strike zone. There was a surprising amount of Reds fans in my section, which was a nice change, as I am usually surrounded by dirty looks all night long. The game started and had quite a brisk pace to it. Leake and Jaime Garcia were pitching very well, and the defense for both teams was strong. Before long, it was the sixth inning, and Leake singled strongly to start the inning, followed by an unconventional Brandon Phillips patient plate appearance that resulted in a walk. Then, Votto came to the play and, having already walked and singled, CRUSHED a pitch to center. 3-0 good guys. Leake continued to deal, and Bruce drove in Votto in the top of the ninth for a 4-0 lead. Leake was done for the night, and, in another out of character move, Bryan Price pitched Aroldis Chapman in a non-save situation against the heart of the Cardinal order, which he subsequently moved through, striking out Jhonny Peralta with a 101 MPH fastball and getting both Matt Holliday and Yadier Molina to ground out to Votto. Cardinals fans were leaving the stadium disgustedly, but I could not have been happier; it is always a good feeling when Cardinals fans go home sad because of the Reds. 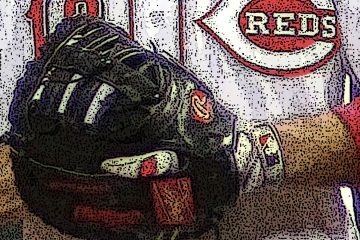 The Reds are in the midst of a depressing season, and the end cannot come soon enough. Nevertheless, for one night, they were the better baseball team, thanks to Mike Leake’s virtuoso performance and Votto being Votto. 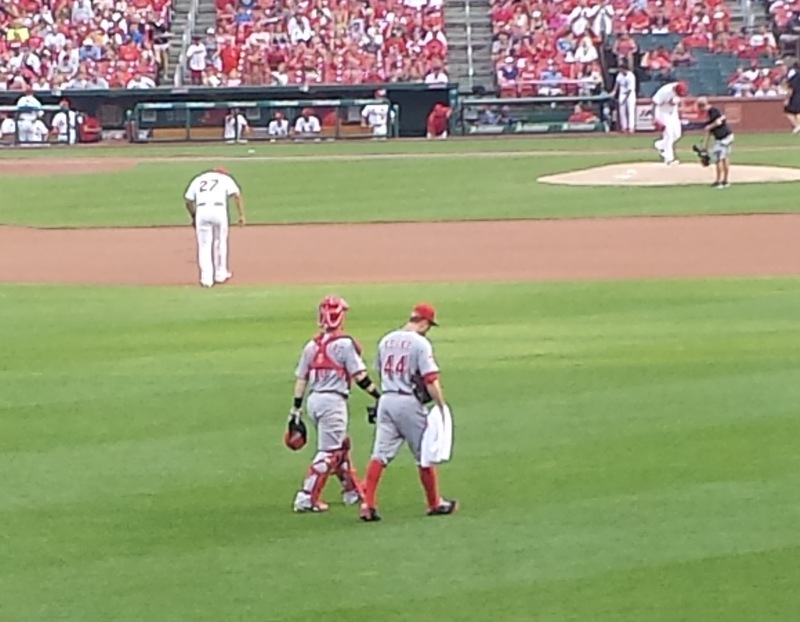 It was a bittersweet feeling, however, knowing I had probably seen one of my favorite players for the last time pitching in a Reds uniform, but I am glad I witnessed it. It was the end of an era, an era that coincided with my passion returning for this baseball team. But I am not “rebooting” (copyright, Walt Jocketty) like the Reds are. No matter how bad things get, two or three times a year I will be in those outfield seats, cheering on my beloved Redlegs in spite of their on-field or season performance. I will continue to attend their games because, every once in a while, and even though the standings say otherwise, the Reds make us feel like we cheer for the best team in baseball. Your SLU President (Fr Biondi, SJ) was one of my teachers at Cincy St X in late 1960’s. Mike Leake was my favorite Reds pitcher. Hard to believe, after one start with the G-men, he went the DL. Giants are going to need him. Cubs and Pirates slowly pulling away.